In the spring of 2007 the PDC announce this new tournament for the autumn. PDC opens its doors with love to the top players of the BDO and calls it the Grand Slam of Darts. All major finalists in all TV events for the prior two years, both BDO and PDC, qualify for the event. Added to this are the losing semi finalists of both world championships of these years. The event, held in Wolverhampton, has arguably the best field of players in any darts tournament. The qualification criteria change throughout the years but the major change comes in 2015 when the Grand Slam is ranked for the PDC Order of Merit. When Eric Bristow passes away in April 2018 the Grand Slam of Darts trophy is renamed “The Eric Bristow Trophy”. From the twelve editions held so far Phil Taylor has won six. Scott Waites claims the title in 2010 and is still the only BDO player to do so. In 2012 Raymond van Barneveld beats compatriot Michael van Gerwen. Mighty Mike is the strongest in 2015 and retains his title in 2016 and 2017. 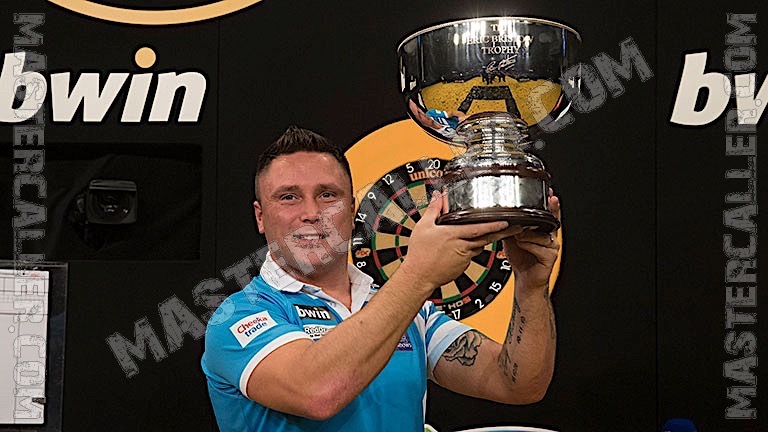 In 2018, Gerwyn Price wins his first major tournament.